OZR 5000 Trace Oxygen Analyser manufactured by Orthodyne meets the requirements of industrial gas production and thermal treatment industries. It includes the MicroPoas® zirconia sensor technology with built-in metallic reference. When you use MicroPoas®, you optimise your installation and process safety. Zirconia sensor with built-in metallic reference : completely independent from the external environment. No need for a reference gas : easy set-up. The MicroPoas® sensor enables our analysers to deliver excellent accuracy and unequalled linearity and enables you to reduce maintenance costs and keep them under control. Its sturdiness guarantees lower and mastered maintenance costs. From measurement of oxygen fugacity in volcanic gases to microelectronics, the MicroPoas® technology is adaptable to a wide range of applications, in both industrial and scientific fields. Flow rate Minimum fl ow rate without bypass : 30 ml/min. alarm. Thresholds can be adjusted over the range. 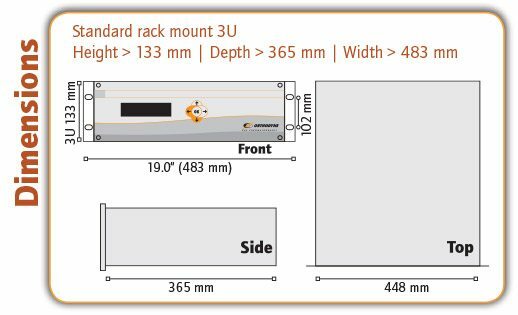 *OZR 5003 and OZR 5004 will be assembled inside a rack of 365mm depth and 6U height.